American metal band Mastodon is proof that a New Wave of American Heavy Metal progenitor can shed its skin and evolve into something better. Early material (Remission and Leviathan) found them traversing the same ground as their peers garnering labels of math metal to sludge metal (possibly their most definitive addition to the scene) to progressive metal. Frankly, in those days, I could lump them with Trivium, Lamb Of God, or Atreyu without as much as a hiccup. Yet, like their peers Atreyu, Mastodon has discovered that continuing in the olds paths is not only redundant, but morosely uncreative. 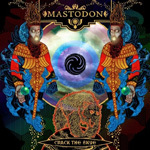 With 'Crack The Skye,' Mastodon has made a nearly complete break with past moving into a more modern progressive metal sound. As profound it is to find a New Wave of American Heavy Metal progenitor progressing in substance and style beyond their peers, Mastodon's 'Crack The Skye' is a needlessly tedious venture of massive proportions. Listeners could be encouraged to have an energy drink in hand as they wade through this disc.